How many genebanks are there in the world? 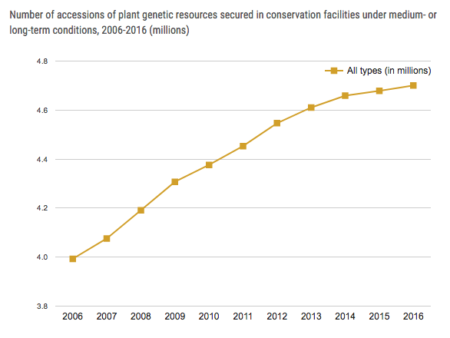 By the end of 2016, 4.7 million samples of seeds and other plant genetic material had been conserved in 602 gene banks across 82 countries and 14 regional and international centres. Over the past 11 years, the rate of increase in gene-bank holdings has slowed. Based on figures from the World Information and Early Warning System (WIEWS) and country reports, it is estimated that about 7.4 million accessions are currently maintained globally, 1.4 million more than were reported in the first SoW report. Various analyses suggest that between 25 and 30 percent of the total holdings (or 1.9-2.2 million accessions) are distinct, with the remainder being duplicates held either in the same or, more frequently, a different collection. 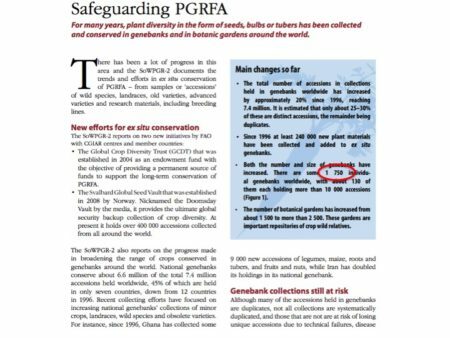 Germplasm of crops listed under Annex I of the ITPGRFA is conserved in more than 1,240 genebanks worldwide and adds up to a total of about 4.6 million samples. 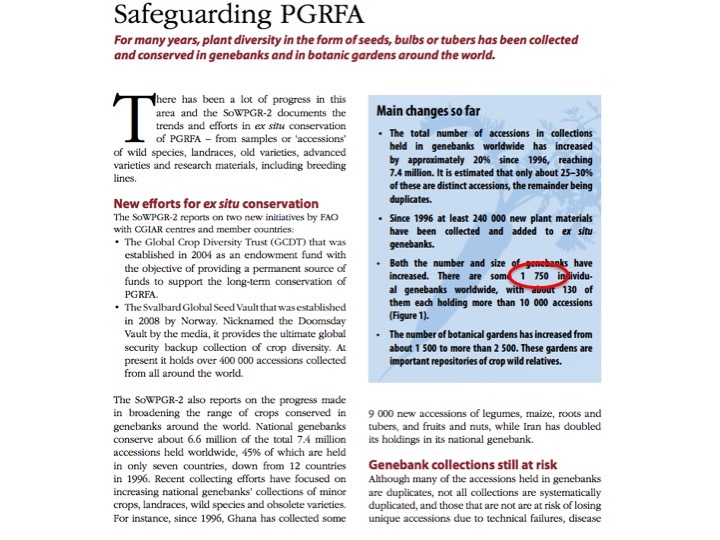 Of these, about 51 percent is conserved in more than 800 genebanks of the Contracting Parties of the ITPGRFA and 13 percent is stored in the collections of the CGIAR centres. Anyway, I’m sure all this will be sorted out in due course. Let’s not quibble. It’s difficult pulling these data together from dozens of countries, plus regional and international organizations as well, and just having genebanks recognized as crucial to the goal of ending hunger is pretty cool, no matter how you count them.